Perhaps I’m a little nutty from the heat (okay, I’m nutty all year round!) 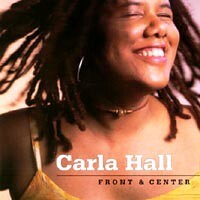 but I’ve decided to offer a special summer sale of my very first CD, Front & Center. Many of you know, or already own, my Soulflower CD, but you may not have even heard of Front & Center, which I’m selling this month only for $7. Front & Center is the live CD that I recorded live in NYC from 1995-1999. At the time, I had just moved to New York City, and had no recording studio budget. So I recorded almost every live show I did, and created a CD from my favorite cuts. Because of my unauthorized rendition of Jimi Hendrix’ “Little Wing”, I was previously forbidden to sell the CD on iTunes. 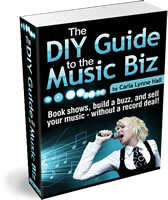 Thankfully, I’ve since worked things out with the Hendrix Estate, but before I re-release this last batch of CDs, I’d like to offer it to my Rock Star Life Lessons readers for the special price of $7! To make things even more intriguing, if you buy Front & Center, I’ll also add my unreleased live EP, Dirty5, for no charge! 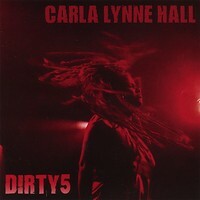 Dirty5 is another live CD of mine, slightly naughty in nature, once even referred to as “A one night stand with music”. I don’t know about all that, but it was a lovely gig recorded during the last days of NYC’s CBGB’s Gallery – it was springtime, and I was feeling free! Soulflower Summer Sale via PayPal. This price also includes shipping and handling! And if you want one or both CDs autographed, just let me know in the “special instructions” section of PayPal’s order form. Make Music New York 2010 – featuring Hungry March Band! 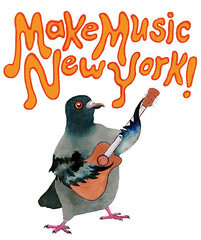 Make Music New York is a live, free musical celebration across the city that takes place each June 21 — the first day of Summer (and longest day of the year). On that day, hundreds of public spaces throughout the five boroughs — sidewalks, parks, community gardens, and more — become impromptu stages for over 1,000 free concerts. Musicians of all ages, creeds, and musical persuasions perform for new audiences, who come out from under their headphones to hear unfamiliar groups risk-free on the first day of summer. Last year’s Make Music NY, I sang in front of my friend’s yummy store, Divalicious Chocolate. For this year’s Make Music New York, I skipped doing a solo gig in favor for participating in a New Orleans-style Second Line parade through the streets of New York City, organized in part by musician Evan Hammer. I ended up becoming a member of Brooklyn’s Hungry March Band for the day, dancing, playing, and parading through mid-town New York City, from Lincoln Center down to Columbus Circle. It was a lot of fun to dance through the streets, with people following and dancing along. It was a happiness-maker, for sure! Check out my video to see how much joy the Hungry March Band had. Please excuse all the movement of my video cam. It was hard to dance and videotape at the same time, but you’ll definitely get the idea of how much fun was had by all! 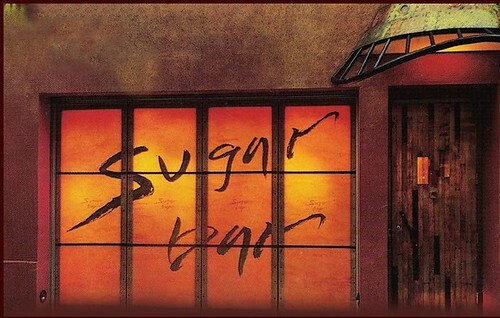 I’m returning to SUGAR BAR!!! This lovely Upper West Side music venue and restaurant is owned by legendary songwriting duo Ashford & Simpson (“Ain’t No Mountain High Enough”, “Reach Out and Touch (Somebody’s Hand)”, “Solid (As a Rock)”, “You’re All I Need to Get By”), and I’m excited to be performing there again. Born in New York City Rothberg grew up in Scarsdale, NY, playing piano from the age of 3 and writing songs by the age of 15, joining a high school Rod Stewart covers band. She later traveled through Europe and America, busking to support herself. Patti’s CD debut on EMI America, Between the 1 and the 9, went on to sell over 250,000 copies in the US and another 200,000 in Europe and Japan. The album title is a reference to the subway platform where she used to busk. 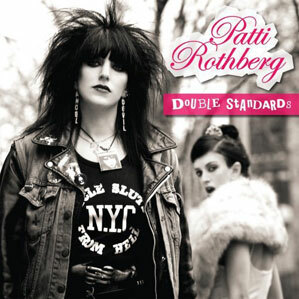 Now Patti Rothberg is back with her third CD, Double Standards, which was released on Megaforce Records. It is the culmination of the melodic pop rock associated with “1 & 9”, and the psychedelic explorations and Queen-like harmonies of her second CD Candelabra Cadabra. The combination is doubly delicious. The title track is an exploration of the concept of good vs. evil, wherein “…the devil loves a double standard and heaven isn’t selling cheap…” The album is split down the middle between hard rock and heartfelt acoustic songs. What brings it all together is Patti’s melodic sensibility and unique lyrical perceptions. Had this been the age of vinyl, the harder songs might all go on one side, the softer on the other. Both are unmistakably Patti and equally true to her musical leanings. Last, but not least, if you’d like Patti to paint a portrait of you, your loved one, or even your pet, contact Patti at *prothberg AT earthlink DOT net*. 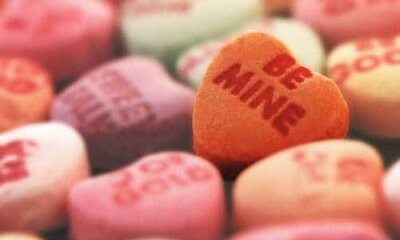 Personalized Songs for Valentine’s Day! Give a personalized song for Valentine’s Day! Once upon a time, there was a boy in my high school who had a crush on me. He was a nice guy, but I only liked him as a friend. To tell you the truth, I could hardly give him the time of day because I was too busy crushing on his best friend. Or perhaps I should say, the only reason I would give him the time of day was because I was crushing on his best friend! Ah, young love… Anyway, I felt bad for him, and went as far as trying to set him up with my best friend. That plan seemed like it was working until one day this young man visited my house for my birthday. I had just received my grandmother’s piano, but since I wasn’t into practicing back then, I had barely touched it. In a matter of moments, this personalized song won over me AND my mother who was eavesdropping nearby. After playing hard to get for months, I instantly had a change of heart, and became his girlfriend. I also had to break the news to my best friend, but that’s another blog post. The lesson that I learned that day is how much power lives in a song that’s written for someone you love. If you’d like to give a special gift for Valentine’s Day that will be remembered always, how about a personalized song for your Valentine? 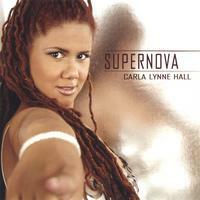 Until February 11, 2010, I’ll be taking requests for personalized versions of my original song, Supernova for $150.00 USD. Imagine your sweetie listening to a song with a verse that is personalized just for him or her! When placing your order, simply include info such as their name, nickname, interests, zodiac sign, special moments, etc, and I’ll rewrite a verse, and record it professionally. If you’re planning to propose, let me know that as well, and I’ll create an extra-special version of Supernova. $150 includes a professionally recorded song with personalized CD label too! Click here to read and hear the original lyrics for Supernova, my cosmic love song. Tonight I’m playing at BB King Blues Lounge in NYC as part of The 6th Annual Hedge Fund Rocktoberfest to benefit A Leg To Stand On (ALTSO). I think I’ve performed in this fundraiser every year since its inception with my classic rock band of bankers, aka Aged Inventory. 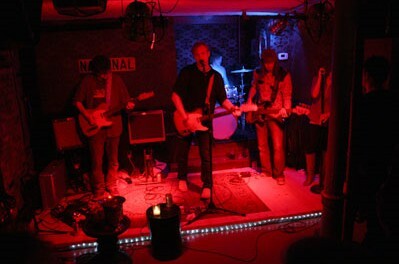 In the past, I’ve performed an electric set, as well as an acoustic one with my banker bros for this gig. Tonight, I’ll be totally solo, in the acoustic Lucille’s Lounge. This will be a late show, but no less fantastic! This unique event brings together members of the hedge fund and financial industries for a night of rock and roll performances in support of A Leg To Stand On’s mission to level the playing field for children with limb disabilities in the developing world. For more information, please visit A Leg To Stand On (ALTSO). My recent “Twitter for Musicians” workshop attracted the attention of musician and producer Darryl Gregory, who also just happens to have his own podcast show, Unsigned Underground. Darryl was so happy with the class that he invited me to appear on his podcast earlier this month. How cool is that?! Underground Unsigned podcast interview with Darryl Gregory. If you were there, you know how much fun we had. Here’s a little video clip that I took of the audience with my Flip camera. Maybe you’ll see yourself! If you couldn’t make it, the video will give you a little taste to hold you til the rest of the video is edited. Thank you so much for a wonderful night. I’m happy to announce that my next show will be on Wed, Sept 23rd at Sugar Bar, the lovely Upper West Side spot that’s owned by legendary songwriting duo Ashford & Simpson. You may remember their famous tunes “Ain’t No Mountain High Enough”, “You’re All I Need to Get By”, “Reach Out and Touch (Somebody’s Hand)”, “Solid (As a Rock)”. This show is a part of Make It Happen Entertainment’s “Rock & Soul” Series, “where the line between Rock & Soul blurs, morphs and merges while each genre maintains the integrity of the music!” Special thanks to Danny Brookings for booking this gig! If you want sweet, Ashford & Simpson’s Sugar Bar can satisfy that tooth. Of course you can fill up on your sugar intake anywhere, but the Sugar Bar offers a different kind of sweet. We are talking sweet music, soul-stirring riffs, runs and melodies in a cozy environment, with delectable cuisine you can find only at Ashford & Simpson’s Sugar Bar. Presenting a fresh alternative to the mundane, the Sugar Bar, is an intimate full service restaurant, where every table has an excellent view of the stage. Intimately immersed in big flavors, live performances, and our signature Sugartinis, an evening here might begin at the watering well where specialty cocktails and a selection of cultural appetizers set the mood and whet the appetite. This venue has a great vibe, and I hope to see you there!